Nintendo DSi is improved, more advanced version of the Nintendo DS system. It offers more computing power, better graphics and ability to play more advanced games. The DSi console is little larger and heavier than DS and especially DS Lite, and for that reason it occupies slightly different niche from the DS / DS Lite in market. The system is back compatible with DS system, which allows sharing all that large number of games. Has a 3.25-inch display, 2 cameras with 0.3 MP resolution, astounding sound quality, plus a slot for SD data cards. 12% slimmer than the regular Nintendo DS, yet packs a brighter, wider screen. Alter and store pictures on your very own photo album or back it up to an SD card for easy sharing. Download new applications and games via the DSi shop quickly thanks to the improved Wi-Fi adapter. Handheld gaming systems were pioneered by Nintendo in the 1980’s. With the DS and Game Boy mobile consoles giving the world the ability to experience gaming on the go. And just as it had introduced mobile gaming, Nintendo is now revolutionizing it by changing the way in which people can experience, access, share, and create content via the exclusive Nintendo DSi portable gaming system, the latest version of the best-selling mobile gaming system. Nintendo DSi hand-held gaming system is very powerful, sleek, compact, and packs a ton of features that take gaming to a whole new level. 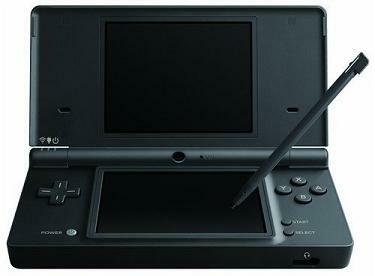 As was the case with the DS and the DS Lite, the DSi is integrated with Nintendo’s advanced touchscreen technology. However, the screens are much larger, and the system itself is much slimmer than its predecessors. The DSi also has built-in digital cameras which allow you to snap shots, enhance them and transfer them to your buddies, as well as the ability to play music in high quality with the new DSi Sound feature, and even the capability to browse the web via Nintendo’s DSi web browser. Whether you want to play games or surf the net, the DSi has everything you need. One of the most distinguishable features of the DSi mobile gaming system are its two digital camera. One of the cameras is pointed at the user, while the other one points the opposite way. Being the very first interactive cameras to have been placed on a gaming system, the DSi digital cameras are equipped with ten different types of interactive “lenses” which are capable of altering your photos, providing you with a simple way of capturing and sharing your photos with friends and family. These cameras also provide you with a unique ability to interact with your games, while offering game developers the ability to enhance their games with new features. Just like the touch-screen provided the DS with the ability to feel, and the powerful microphone provided it with the ability to hear, the cameras provide the DSi with the ability to see. Yet another feature of this mobile gaming system is the DSi Sound, which is an application that can record sound and play music. There are tons of different settings that allow you to change the way the music is played back to you, such as the ability to change the pitch, try out various audio filters, control the speed of the sounds that you record, or change a song’s tempo. The microphone’s location is between the two displays, while the headphone output jack is located on the outside of the gaming system, allowing you to listen to music through your earphones when the screen is closed. The DSiWare (similar to the Nintendo Wii’s WiiWare) allows users to download software that they can purchase with DSi points straight to the mobile gaming system. There is a huge range of software developed by both big and small developers that enhance the experience that you get out of the DSi. DSiWare applications and games will be “sold” at various values, with 200 points being the cheapest price. Backwards Compatibility For Games And Accessories. Besides playing downloadable games, the DSi can play retail games, including those made for the original DS. Over 850 games are available for the DSi. More new and exciting games are currently in development. Even Japan’s favorite rhythm game, Rhythm Heaven, is now available for the DSi. Every DSi gaming system comes with a stylus, a power adapter, an instructions manual, and warranty papers. Request an account and buy this item wholesale.